Teens are tough on everything they come into contact with, from smartphones and tablets to clothing and textbooks. No matter how slick, sophisticated, or expensive something is, teens have an inability to treat it carefully. This applies to furniture too, which is why the pieces you choose for a teen hangout room or bedroom need to be durable as well as comfortable and affordable. The only kind of furniture that meets all of these requirements is a giant foam chair or foam sack. You can purchase foam sacks readymade at FoamByMail.com in a variety of sizes ranging from a three-foot one-seater to a massive eight-foot model that can accommodate up to four adults or six children. Each FoamByMail.com foam sack comes with a twill liner and a zippered suede cover that is removable for easy cleaning. In addition, the covers are available in 12 different colors so you can match the existing decor in your home. 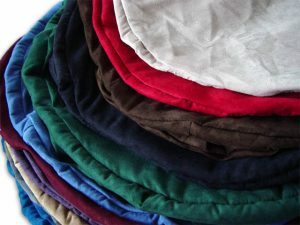 Approximately four to six yards (depending on the size of the foam sack you desire) of inexpensive fabric for the liner. The same amount of a nicer, more comfortable material for the outer cover. Some suggested choices include suede, denim, velour, and corduroy. One long zipper for the outer cover. You may also purchase a zipper for the liner if you wish, but most people elect to sew the liner closed instead. Shredded foam for filling the giant sack. The amount of foam needed depends on the size of the sack and is usually at least 45 to 50 lbs. for larger chairs. If you’re not sure how much shredded foam to buy, contact Foam By Mail for help. Once you get these materials together, you can look up tutorials or YouTube videos to see how others have constructed their DIY giant foam chairs. Rest assured that the process is very intuitive, so if you have even a little bit of experience with DIY sewing projects, this one should be a breeze. Repeat for as many giant foam chairs as you want for your teen hangout room or bedroom and enjoy the results for many years to come!